SEATTLE, WA--(Marketwired - April 18, 2017) - Hiya, the global leader in caller profile and phone spam protection, today announced the launch of its Hiya Business Profiles product, the innovative new way for consumers to find and contact businesses without ever needing to leave the dialer. Samsung Places, available today on the Samsung Galaxy S8, is the first implementation of Hiya Business Profiles. The new feature will replace the "Favorites" tab in the native dialer and provide users with an integrated search and discovery experience that has never been offered before. Most mobile business searches originate via web search or third-party apps even when the intent is to place a call. Designed to eliminate superfluous steps in the click-to-call process, Hiya Business Profiles provides users with all the context they need to find and contact a nearby business from one screen. With Hiya Business Profiles powering Samsung Places, Galaxy S8 users can make 100 percent of their calls directly from the dialer, whether it's to friends, family, their doctor, a restaurant, or any other local business. According to BIA/Kelsey, 85 billion consumer-to-business phone calls were made in 2016, which drove $1 trillion in US consumer spending. 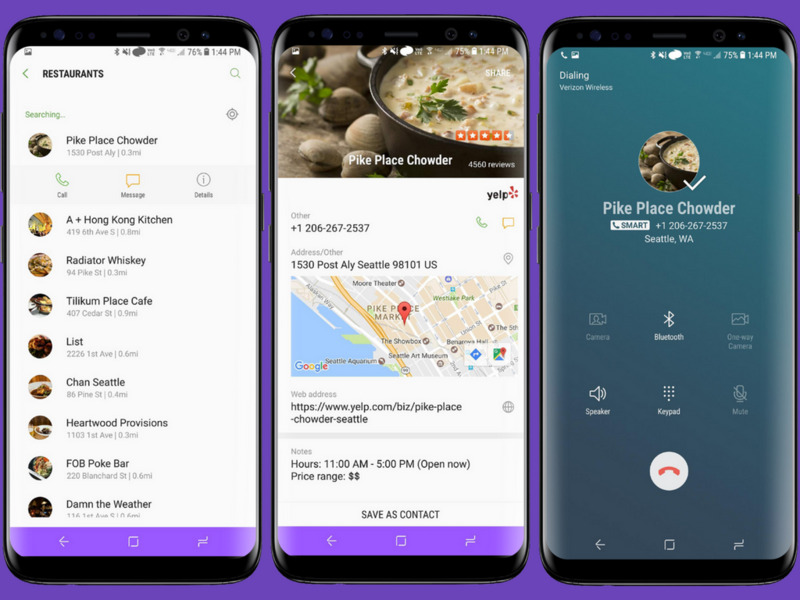 With Samsung Places, the experience of finding and calling businesses is integrated in the dialer and does not require context switching between multiple apps. Whether searching for an emergency plumber, a florist, or a nearby restaurant, all calls can now be executed through the same experience as that of calling your mom. "Phone calls remain the most effective interaction for businesses and consumers and yet, calling a business is a needlessly cumbersome process," said Mayur Kamat, VP Product at Hiya. "With Hiya Business Profiles in place, Samsung Galaxy S8 users will never have to leave the dialer to call a business. Simply put, the Samsung phone app is getting smarter." With Hiya Business Profiles, Hiya has partnered with various third parties, including Yelp and Whitepages to provide the most relevant results. Hiya uses Yelp's new Fusion API v3 to power rich business data and Yelp ratings directly in Hiya Business Profiles and Samsung Places. 1. When users open the phone app, they will see a new tab called Places next to their Log and Contacts tabs. 2. Users can quickly search, find and call any local business right from the dialer. 3. Users will have the option to find new businesses directly from the phone app by searching categories such as Restaurants, Shopping, Health, Automotive, Financial, Travel, Public Services, and more. 4. Places will also recommend relevant businesses to the user based on their location and time of day. Hiya Business Profiles is launching in 27 countries in the Americas, Europe, Asia and Australia. Hiya Caller Profiles also already power Smart Call, Samsung's caller ID and spam protection service that is being upgraded for the Galaxy S8 with faster performance, richer business data and Hiya's newest Reputation Services Engine for industry-leading spam protection. Hiya is revolutionizing the way people make and receive phone calls. With a mission to provide a better phone experience, Hiya Caller and Business Profiles provide users with important context, giving them the right information at the right time. Through analysis of more than 3.5 billion calls and texts per month, Hiya protects tens of millions of users from unwanted robo and spam calls globally. Hiya is available as a consumer app on Google Android and iPhone and is integrated into the phone experience for AT&T Call Protect, T-Mobile Name ID, ZTE Axon 7 and Samsung Galaxy S7 and Galaxy S8 users worldwide. For more information, please visit www.hiya.com. 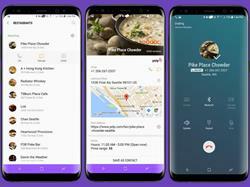 Hiya Business Profiles powers Samsung Places, the newest feature on the Galaxy S8, streamlining phone communications between consumers and businesses. With an integrated search and discovery experience, users can quickly search, find and call any local business directly from the phone app.